Were you aware of the following facts? More than 3.4 million people die each year from water, sanitation, and hygiene-related causes. Nearly all deaths, 99%, occur in the developing world. Lack of access to clean water and sanitation kills children at a rate equivalent of a jumbo jet crashing every four hours. Of the 60 million people added to the world’s towns and cities every year, most move to informal settlements (i.e. slums) with no sanitation facilities. 780 million people lack access to an improved water source; approximately one in nine people. In fact, the water and sanitation crisis claims more lives through disease than any war claims through guns. An American taking a five-minute shower uses more water than the average person in a developing country slum uses for an entire day. Over 2.5X more people lack water than live in the United States. However, while drilling a well can be easy, delivering water and sanitation solutions that are sustainable in the long haul is not and involves a number of important components. One of the solutions proposed by water.org is the WaterCredit : it is a new way to apply smart thinking to the world’s water problem. It’s the first program to put microfinance tools to work in the water, sanitation and hygiene sector (what they call WASH). WaterCredit puts the power of water directly into the hands of the people who need it. 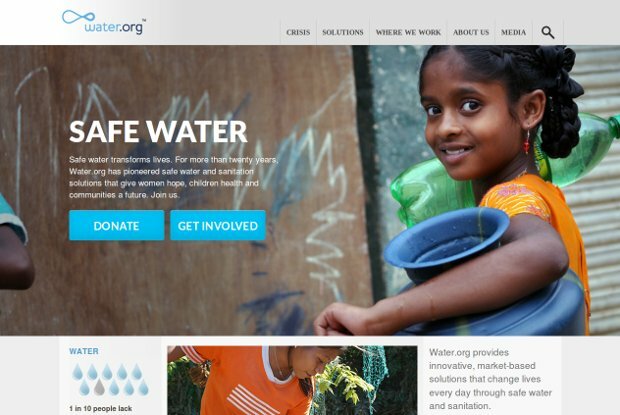 WaterCredit empowers the world’s poor with access to small loans for household water connections and toilets. It is breaking the cycle of poverty and creating a cycle of opportunity – an opportunity to enhance one’s health, education and economic position.